I have joined Chris’ Mommy Moments with the January 16 theme of “First Picture of Your Kid/s.” I saw the first pictures of other blogging moms’ kids, and I also wanted to share my son’s first photo. 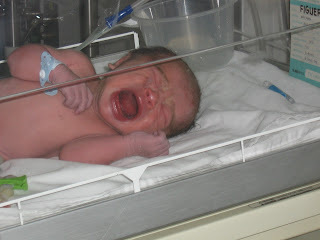 Here’s Justin Edward Figuerres’ first picture taken a few minutes after I delivered him via caesarean section. 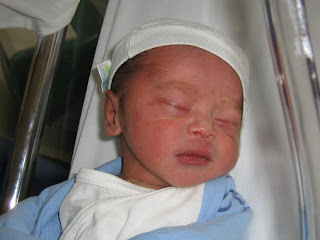 He was born on July 7, 2006, 8:16am, weighing 5lbs. and 10 ozs. And here was Justin sleeping snugly afterwards. This entry was posted in Baby, Mommy Moments, Pictures. Bookmark the permalink. Hi Mommy!!! the photos are wonderful…I never saw my baby crying after birth, except when he was roomed-in with me already. Awwww look he is crying really loud must be hunrgy! How sweet. He looks so peaceful. Come from far place to read your articles… Good info..
Hello Justin Edward! It’s so nice to reminisce through photos.